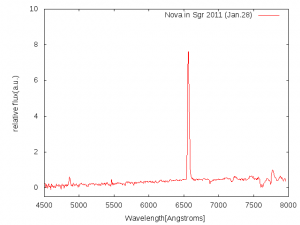 We performed low-reslution (R~550) spectroscopic observations of the possible nova in Sgr (= PNV J17474639-2335112 listed in the TCOP of CBAT web page) using Araki telescope and LOSA/F2 at Koyama Astronomical Observatory on 2011 January 28.863UT. Our observations were carried out under the cloudy sky. 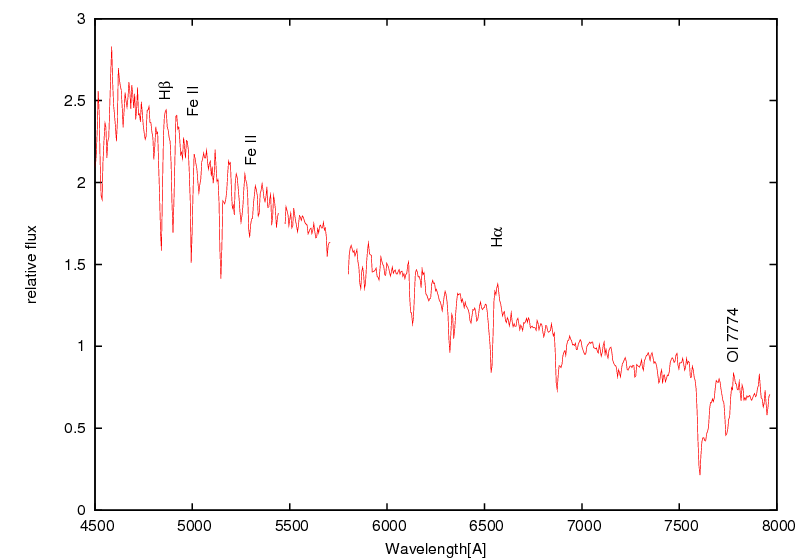 The spectrum of the object shows prominent emission lines in H-alpha, H-beta and O I (777.4 nm) on a highly reddened continuum light. These features suggest that the object would be a classical nova past the maximum light reddened by interstellar mediums. 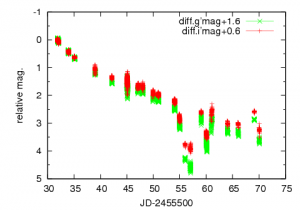 We update our light curves of OT J012059.6+325545. Our latest observations were performed on Jan. 19. The object showed a rapid and deep fading between Jan. 17 and 18. But, a large rebrightening was observed again on Jan. 19. A large spike was also observed at the last part of its rebrightening phase of WZ Sge in 2001 outburst (ref. Ishioka et al. 2002 and http://vsnet.kusastro.kyoto-u.ac.jp/vsnet/DNe/wzsge.html). 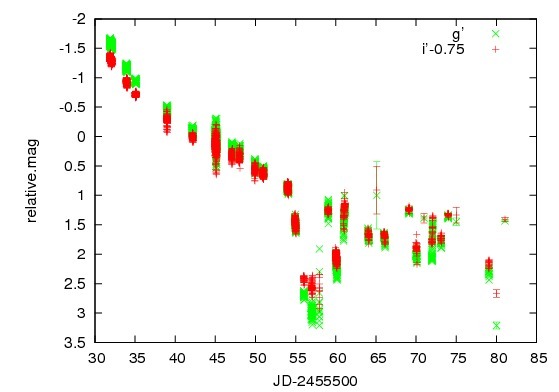 We specurate that this large rebrightening of OT J01205+325545 may be also the last rebrightening of the current rebrightening phase, because the rebrightening phase of OT J01205.6+325545 is very similar to that of WZ Sge. 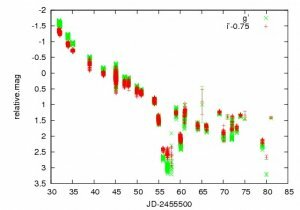 We carried out the low-resolution spectroscopic observations of "Possible Nova in M31" on Jan. 11 according to the discovery by K. Nishiyama and F. Kabashima. 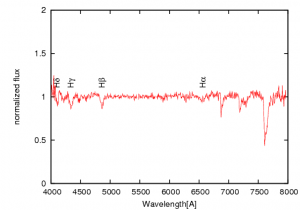 Our observations were performed by 1.3m Araki telescope and LOSA/F2 spectrograph. 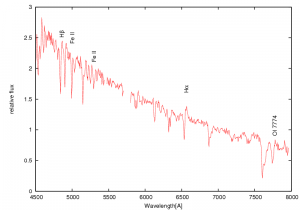 The spectrum shows clearly P-Cygni profiles at H-alpha, H-beta, Fe II and O I lines. The absorption minmum at the H-alpha line is blue-shifted by about 1300km/s. 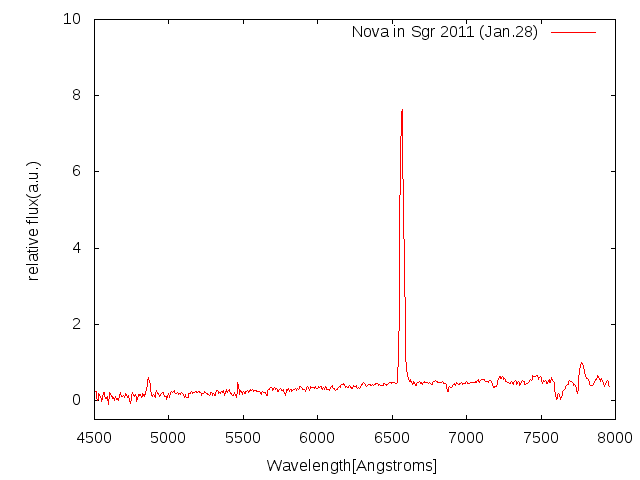 These features indicate that the object is a classical nova in very early phase. [dwarf nova] MisV1443 (=TCP J06195996+1926590) : spectrum on 10 Jan.
We obtained a low-resolution spectrum of MisV1443 according to [vsnet-alert 12580] on 10 Jan. using 1.3m Araki telescope. 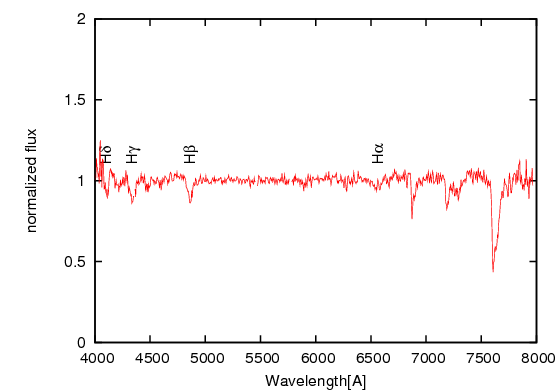 The spectrum of the object shows bload balmer absorption lines and the weak Ha emission line. Our result is consitent with that by 1.82-m Plaskett telescope(*1). 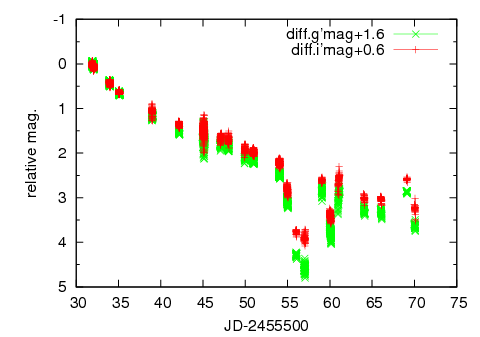 The figure shows our preliminary light curves in g' and i' bands. The vertical axis indicates that the relative magnitdues (not apparent magnitudes). We confirmed that the color of the object became red just after the rapid fading. The object is now in a rebrightening phase which is similar to the phase of WZ Sge in 2001 outburst.